When I was a kid, my brother and I were always told by our parents to wash our hands before and after eating. Although we feel lazy to do it, we still obey because we don't want to be reprimanded. For me, washing my hand was merely a routine. Everytime we dine somewhere else like in restaurants or when we eat something while inside the car, we were told to use hand sanitizers or alcohol. Because of this, handwashing and sanitizing our hands became a habit until we grew up. I always have a hand sanitizer with me or an alcohol. It is one of my must-haves whenever I leave the house. Now that I am a parent, I am also trying to teach my kids the importance of keeping their hands clean. Aside from hand washing, I teach them to use hand sanitizers whenever it is not possible to get a soap and water. But if we look into it, this is just a very small portion of the huge responsibility in taking care of the kids. Well, parenting is never easy. Aside from teaching our kids the right manners and attitude, we also have to make sure that they are always healthy. That is why we force them to take their vitamins every day. We would restrict them to eat certain kinds of food since it might make them sick. We would do anything and everything when it comes to our children's health. One way to ensure that they will not get unwanted bacteria is by making sure that their hands are clean. We all know that the hand is the number one carrier of germs. Germs can spread to the hands by sneezing, coughing, or rubbing the eyes. Many diseases and conditions can be easily transferred to other family members or friends through the hand. Keeping the hands clean is a good start in staying healthy, then everything else will follow. It will not just bring good health but also a huge smile to your children's faces. An effective way to teach kids about keeping the hands clean is to instill awareness about certain germs that can be acquired because of touching things. Merely opening the door can already transfer hundreds of germs to the hand. And when the hands reach the face, mouth and other parts of the body, the germs are spread. So, what are the germs that can be found on the hands? There are actually a lot! And according to Bright Hub, over 150 different species of bacteria can also be found on the hands. And each one of them can cause a certain kind of disease. Once your child will know this, they will no doubt volunteer to bring with them their own hand sanitizers. Hence, as parents, we have to buy them one. But, it shouldn't just be any kind of hand sanitizers. It has to be trusted because the health of our kids seemingly depends on our choice of product. Belo Baby Hand Sanitizer Is a Perfect Choice! If you want to ease your worries, the Belo Baby Hand Sanitizer is a great choice. Don't be tricked in buying those that come in fancy packaging because you do not know if it can protect your child. I recommend that you try the Belo Baby Hand Sanitizer because it kills 99.9 % of germs and bacteria. And of course, it is hypoallergenic and dermatologist tested. Aside from that, you wouldn't need to worry about its components since it is especially made for your child. It is carefully formulated without harmful chemicals. It also has glycerin that moisturizes the skin. Hence, it is gentle to your child's skin while killing harmful bacteria. You will also love the scent which is suitable for the children and would leave the skin fresh. It comes in three different variants: Peach, Green Apple and Blueberry. In Belo Baby Hand Sanitizers, you will not find the usual strong scent of hand sanitizers in the market. All three variants has a mild and fresh smell. My daughter's favorite is Peach. It smells really sweet that it reminds me of peach flavored candies! This is perfect for chic little ones just like my daughter. This one has a gentle smell which reminds me of the cologne I used when I was still in elementary. Even if you put a lot of it on your hands, the smell won't hurt your nose. If you or your child have a sensitive sense of smell, then the Blueberry variant would be perfect. It is like your are smelling something good but you won't get enough of it! Well, whatever variant you choose, you'll never go wrong with any of it because their components are the same and only the scent differs. It would have the same effect to your child's delicate skin. For sure, the Belo Baby Hand Sanitizers will give you a worry-free day since it is "crafted with care for the most delicate skin, for the most meticulous moms.” Since it is gentle to the skin and it smells really fresh, the children would love to bring it along with them wherever they go! 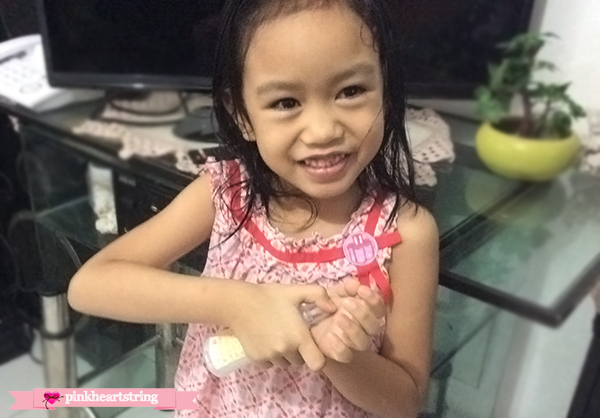 Want to know more about the #BeloBaby Hand Sanitizers? Check out their website (www.belobaby.ph), or follow them on Facebook (belobabylove), Twitter (@belobabylove), and Instagram (@belobabylove).